Beginning in May 2011, a group of walkers will embark upon a journey from the Pacific Northwest of the United States, walking 6,000 miles to Washington DC. The walkers will hold numerous candle light vigils along the trek at the specific places where people have been murdered or have taken their own lives due to gender expression/identity discrimination or bias. 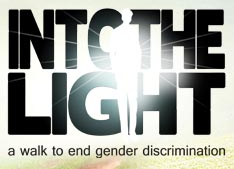 Providing gender expression/identity workshops and civil disobedience trainings along the way and theatrical performances inspiring people to walk into their own light and true potential, this 9-18 month journey will help raise up more voices in the effort for full social and legislative equality. If you would like to help us with the tasks below or in some other capacity, please reply to this email noting what area(s) in which you would like to help. A little help can go a long way to make sure the Into the Light walk reaches its maximum impact. Together we will walk into the light of the world in which we want to live as we remember those we've lost! Thank you for your time and consideration. Leading up to and during the journey, the Into the Light walking team is asking for donations that will cover the team’s basic expenses. And, 10% of every dollar raised will go directly to other charities whose missions are aligned with the purpose of this walk – to end gender discrimination.